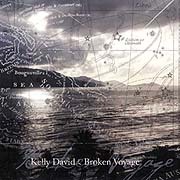 After listening to Broken Voyage, it is obvious that synthesist Kelly David believes that the ear is a portal to another place. David's work has an effect on the imagination that is almost catalytic. Through his efforts we sail along on a current of sound, into dark personal explorations of form and material, structure and tonality. Timbre and pacing are the stars of this album and guide this navigator as he plows the deep. Ideas roll and churn smoothly and intelligently, alternating course between advancing tribal-synth rhythms, slowly swirling pools of harmony and ever-evolving manipulations of tone. Kelly's experiments in sound can send a note screeching inside out then back in on itself in a maelstrom of sonority, or just as easily resolve into a safe and calm passage - as natural and inevitable as the tide. These contrasts make for an interesting and compelling voyage, one that may never even reach the shore, entirely within the vastness of our own daydreams.